What great news: The Byron Shire Events Policy was refused by the NSW State Government last week. To everyone: We could not have achieved this win without you. To all the wonderful artists who assisted big time - Michael Franti, Ben Harper, John Butler, Kasey Chambers, The Cat Empire, Blue King Brown and EVERYONE else: THANK YOU. The Byron Shire Events Policy is no longer THE WORST MUSIC POLICY IN AUSTRALIA thanks to all of your extraordinary support and involvement. This is a win for everyone who loves the Arts, Music and Culture in our country - and even more - the rule of law and the democratic principles on which Australia exists. “We also want to thank Cr’s Heeson, Tucker and Woods for their support in voting against the policy and will advise who is standing - and who will support the Arts, Bluesfest and our event site in future E News to you. we received via Facebook and email. Peter, that's awesome!! I am proud of you for standing firm and proud to have helped in the effort. I hope to see you in Byron next Easter. Michael Franti, Musician, via email from Sumatra. Congratulations to Peter Noble and others who spearheaded the campaign to protect Festivals and events in the Byron region. Sanity has prevailed. This is a huge win for everyone, and sends an important message nationally about the importance of supporting our arts initiatives, events and venues � permanent and pop-up. We'll be back soon to celebrate with you. Three cheers from THE CAT EMPIRE, via email. Congratulations. A big win for those who love music and those who accept a better idea. Steve Scherri, CEO of Emedia Campaigns, via email. Huge Congratulations to Peter Noble Re the News regarding Events in our Area with the State Gov Canning the Events Policy ~ You're a Champ Peter~ Thank you for caring and giving us such great entertainment on the North Coast ~ Here's to you ~ Smiles. Tara Blackman, Bluesfest friend, via Facebook. Good to see a victory for the best festival director in the country... I think the most interesting point of the article is how Byron council ignored its own advice on the legality of the policy & wasted thousands of dollars from the rate payers of Byron... will be interesting where it all goes from here...Blind Benny, Bluesfest friend, via Facebook. Small step for man, giant leap for common sense. Well done Peter (+crew). Peter Conaty, Bluesfest friend, via Facebook. 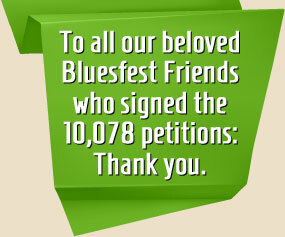 Congrats Peter, Bluesfest Crew and all supporters of the petition. So good to see sanity prevail. :)) Irene Apap, Bluesfest friend, via Facebook. Congratulations and yay - glad Peter Noble and clan had the fortitude and the capacity to persist, rally, pursue and finally succeed in this matter - if it wasn't that it would effect the local community the council should be liable for compensation. Paul Hay, Bluesfest friend, via Facebook. Nice one. The lovers of music and colour from Pepperland defeated the Blue Meanies. You could make an animated film about this.... Tom Plant, Bluesfest friend, via Facebook. We bought our tix on the way out the door. By far the best run big festival we've been to and worth the travel from NZ. We were so impressed with the way your community connects with this event. Long may you continue. Great news :) Zeb Davies, Bluesfest friend, via Facebook. Thank you for all the phone calls and emails about putting the ‘Time to Pay’ option back up. We heard you loud and clear. A new 3 month “Time to pay” option is now running, which gives you the opportunity to pay off your tickets over 3 months and 4 easy payments at the discounted Early Bird price. 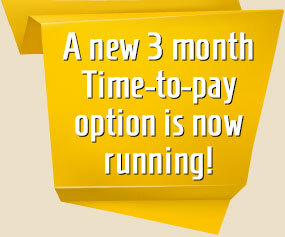 Click on this link to find out how the "Time to pay" works. Still available right now, but are getting close to 80% sell out. The 5 day Early Bird Ticket ($355 per person) and the Buddy Packages ($1130 per couple for 5 Day Festival and 6 night camping) are the hottest sellers. There will be another price increase soon, sorry everyone, but we can’t keep selling tickets at this low rate, especially with the kind of artists we are working on delivering to you! The most luxurious way to enjoy Bluesfest and these tickets are selling quickly, the quota is filling week by week. Remember: There are not many tickets of this type available. If you would like to be one of the special festival lovers to view your favourite performers close up from a raised and private seating area enjoy the Diamond VIP hospitality service, experience a full backstage tour at Bluesfest 2013 plus much more, this is your ticket of a lifetime. Click on this link to find out to find out more about the Diamond Packages. As always, it’s a hugely popular ticket and selling fast. This ticket gives you access to the Bluesfest VIP Lounge - enjoy the ambience of the Bluesfest VIP area, relax on comfortable lounges and purchase premium drinks straight over the counter. It's the ultimate chill out area, the perfect place to hang out with your friends and also enjoy the secluded garden area. 18+ years only. For more information on the VIP tickets please click on this link which takes you to our Ticket page. For the first time EVER - you can reserve your own Festival campsite at Bluesfest! Enhance your Bluesfest experience by reserving and guaranteeing your Campsite right NOW. For an additional cost of $175 only you can pick & reserve your site from a premium, selected camping area at Bluesfest. Limited 5 Day reserved campsites are now available. Click on this map to check out what’s available! They are back and on sale now. Extra Large Vehicle Campsite are separate from the Reserved camping, but absolutely necessary to book if you intend on bringing motor-homes, Winnebago’s, RVs, campervans or caravans. For a small fee of $35 per vehicle per night you will get more space to park your vehicle. Click here to find out more about the Extra Large Vehicle Campsites. on the great specials that are on offer right now. Artist Applications to perform at the 24th Annual Bluesfest 2013 are NOW OPEN until the 31st of October 2012. We look forward to receiving your CD and Bio! Important: Please also supply your email address. Our goal is to notify all applicants (successful or not) by mid January 2013. Best of luck with your application and we are certainly looking forward to listening to your music. You are the best and we are very grateful! !